11/16/2018 | Global Collaboration | Holmberg, M., McCormick, A. This article is part one, of a two-part series written by Margaret Holmberg and Ashley McCormick. It provides an overview of the US based, international organization: The Alliance for the Advancement of Infant Mental Health (Alliance). All Alliance associations are encouraged to become a WAIMH affiliate: 26 of the 29 U.S. Alliance member associations are WAIMH Affiliates; 3 of the 29 member associations are in the process of applying/becoming a WAIMH Affiliate; and 2 international U.S. Alliance member associations are WAIMH Affiliates.This article outlines a brief history of the Alliance and identifies current initiatives within the Alliance and introduces results of a 2017 survey conducted by the Alliance with a view to furthering understandings of: what makes an infant mental health association strong. All Alliance member associations were invited to participate. The results of this survey are aptly described by the authors as a consolidation of the “inspiring work of the Alliance association members”. The authors summarize this impressive and far reaching national and international body of work in the field of infant mental health via a synopsis of a presentation: “What Makes an Infant Mental Health Association Strong?” by Ashley McCormick. What a pleasure and honor it has been to be involved with promoting infant mental health competency through the Competency Guidelines® and Endorsement for Culturally Sensitive, Relationship-Focused Practice Promoting Infant and Early Childhood Mental Health® (Endorsement®). Both the guidelines and Endorsement® system are particularly important as early relationships have become a prominent concern for an increasing number of child care providers, home visitors, clinicians, policy makers and faculty. These standards and Endorsement® now identify more than 2,200 endorsed professionals who are connected through The Alliance for the Advancement of Infant Mental Health, Inc.®, referred to as the Alliance in this article. The journey toward the formation of the Alliance is a result of many people putting their feet to the ground and their voices in the air for infants, toddlers and their families. What started in early 2000 through the efforts of the Michigan Association for Infant Mental Health (MI-AIMH) has grown into a strong, grass roots organization, with 29 infant mental health state associations, including affiliates in Western Australia and Ireland. Deborah J. Weatherston, who retired as the Alliance Executive Director in July of 2018, has supported our paths in each of our states and regions. Debbie brought first one then two then many infant mental health state associations together in 2003 to discuss issues of competency and recognition through Endorsement® for the workforce for infants, toddlers and their families. She then steered us to a highway of formal operations as an Alliance in 2016. We are so grateful for Debbie’s compassionate direction and leadership. Alliance member organisations: All Alliance associations are encouraged to become a WAIMH affiliate. 26 of the 29 U.S. Alliance member associations are WAIMH Affiliates; 3 of the 29 member associations are in the process of applying/becoming a WAIMH Affiliate. The 2 international U.S. Alliance member associations are WAIMH Affiliates. Competency Guidelines and Endorsement: Today with Nichole Paradis in the role of Executive Director of the Alliance, the Board and Alliance member associations are rapidly moving forward by expanding the Endorsement for Culturally Sensitive, Relationship-Focused Practice Promoting Infant and Early Childhood Mental Health® to include those working with young children 3-6 years and their families (Early Childhood Mental Health Endorsement®). The Alliance is making the Competency Guidelines® and Endorsement® available to our Spanish speaking workforce. Global connections and partnerships: The Alliance is identifying important partners that have nation-wide connections. The Alliance currently has an agreement with Healthy Families America (HFA), a widely recognized national home visiting model practiced in many states with federal dollars, to provide reflective supervision/consultation training to HFA supervisors to better assure the integration of infant mental health principles into home visiting practices and to encourage Endorsement®. Achieve OnDemand Ounce of Prevention, Erikson Institute FAN Training, Fielding Graduate University, Wayne State University Infant Mental Health Dual Title Program in Infant Mental Health, Early Relational Health Screen and UCDE Napa Fellowship/Parent-Infant & Child Institute are other entities with widespread connections who are committed to promoting the Competency Guidelines® as best practice standards for the field. Other initiatives that the Alliance is advancing include incorporating the Diversity-Informed Tenets (Irving Harris Foundation, USA) into our trainings and setting diversity and equity as priorities for the field. The Alliance has partnered with the national organization, ZERO TO THREE, to establish a directory of state contacts for families and young children who are separated at the US border. The Alliance has produced position papers on the consequences of parent and young child separation, as well as the use of the baby and mother relationship as a vehicle for repair for mothers addicted to Opioids. Annual Leadership and reflective supervision/consultation summits: Of additional importance, members of the Alliance have come together annually for the past 11 years to participate in a 2-day Leadership Summit and for the past three years for a 3-day Reflective Supervision/Consultation Symposium with over 100 infant mental health professionals in attendance. These events allow Alliance members to raise issues that are forefront for babies and families in their states and countries, to discuss with other Alliance members resolutions to those issues, and to advocate for training, research, policies, and practices needed. Each year, through the lens of the Competency Guidelines® and Endorsement®, members of the Alliance summarize their annual activities that promoted infant and early childhood mental health (IECMH) principles and practices throughout their states and countries. What makes an Infant Mental Health Association Strong Alliance Survey 2017: Each year for the past 8-years, participating IMHA leaders have prepared annual activity summaries that offer specific examples of the use of the Competency Guidelines® and Endorsement® in promoting infant and early childhood mental health (IECMH) principles and practices in their states or countries. This year we suggested that Alliance leaders summarize their reports using the following topics: the relationship between infant mental health (IMH) and other 0-3 and family programs; sustainability; grant activity and fund development; in-service training and higher education; community collaboration; policy development and systems change and reflective supervision/consultation (RSC). Twenty-five of the 31 Alliance member associations contributed to the activity summaries and we look forward to hearing from newly established members next year. The results of this survey consolidate the inspiring work of the Alliance association members. What makes an infant mental health association strong?” In answer to this question, the first two of the seven key areas are addressed below; identity and cross- systems collaboration (the following fove areas are addressed in Part Two). Identity: the quality(ies) or belief(s) that distinguish an IMHA; strong mission and vision statements that define who they are and their scope of work within the IECMH field. IMHA have similar but varied mission statements. They include things like: increase collaboration among parents, caregivers, agencies and systems that touch the lives of infants and young children; foster public policy at the local, state and national levels to support the healthy social and emotional development of infants, young children and their families; and, promote optimal IECMH by way of supporting the birth-to-six professionals who work with or on behalf of infants, young children and their families. Strong associations are able to use their mission to help guide and define who they are, who they serve, and how they serve those identified. Here are examples of associations who have successfully defined the scope of their work and allocate their time and resources accordingly. A statewide organization for multidisciplinary professionals, who work to support the relational and emotional development of families from pregnancy through early childhood. This statement exemplifies the association’s commitment to “who we are” by focusing on enhancing the benefits of membership to their association. For example, the 2017 annual membership dues provided access to a bi-monthly newsletter, 6 low-fee training opportunities, 2 free trainings, invitations to state conferences where competencies were assigned to workshops and networking opportunities. NJ-AIMH members were also offered access to other IMH professionals across multi-disciplinary fields. By focusing on the “who we are,” NJ-AIMH ultimately strengthened “what we do” by providing IECMH professionals with workforce development tools that would help them succeed. Identity and the importance of connections with key individuals who can speak to and for the mission or vision: The Colorado Association for Infant Mental Health (Co-AIMH) emphasized the importance of connections with key individuals who can speak to and for the mission or vision that defines the association within other circles. These essential connections were shown throughout diverse Board leadership, advisory committees, committee chairs and liaisons. Jordana Ash, Past President for (CoAIMH), was appointed the first Director of Early Childhood Mental Health at the Colorado Department of Human Services (CDHS) Office of Early Childhood (OEC) in 2016. She serves as a liaison between CoAIMH and CDHS OEC, facilitating a close working relationship between the two and keeping both of their best interests in mind. Identity and current websites: The Connecticut, Kansas, Iowa, Michigan, Oklahoma, Rhode Island and Tennessee associations all spoke to the priority of updating and keeping their association websites current and in line with their association “branding” to increase the likelihood of member use. It is clear from the summaries that identifying who you are as an association and having a strong “voice at the table” to represent IECMH values and beliefs is essential to building a strong IMHA. Cross-Systems Collaboration: the ability to work together, across systems, on an activity or project of mutual interest on behalf of infants, young children and their families; to cooperate with others to produce something. Twenty-one out of the 25 associations described working closely with other systems, services or agencies, for the well-being of infants, young children and their families, as people from diverse service settings and disciplines sought funding to secure or strengthen competency-based workforce development through Endorsement®. 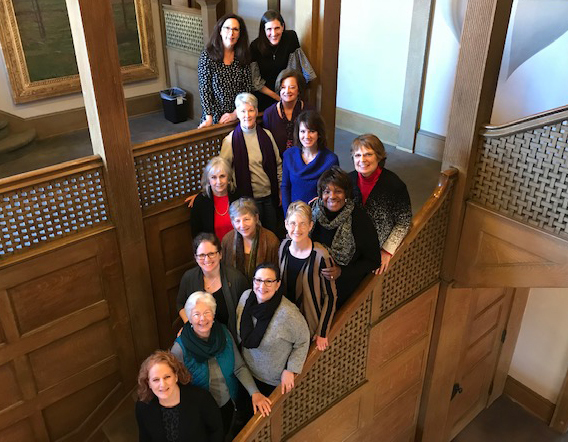 An Oklahoma Association for Infant Mental Health (OK-AIMH) Board member attends regularly scheduled Department of Health meetings and co-led the administration of the Infant and Early Childhood State Strategic Plan. A representative from the Rhode Island Association for Infant Mental Health (RIAIMH) sits on the Office of the Child Advocate’s advisory board, the RI Early Learning Council and the advisory board for RI’s new Safe and Secure Baby Court. The Iowa Association for Infant and Early Childhood Mental Health (IAIECMH) collaborated with Prevent Child Abuse Iowa to sponsor an IMH track at their annual conference last spring. The Michigan Association for Infant Mental Health (MI-AIMH) has partnered with the Infant Mental Health Home Visiting (IMH-HV) evaluation team that is taking place through the Michigan Collaborative for Infant Mental Health Research, involving researchers, clinicians and community representatives to examine the effectiveness, efficacy and impact of the Michigan IMH-HV model. Participants include: University of Michigan, Michigan State University, Wayne State University, Eastern Michigan University, Central Michigan University, the Alliance and the Michigan Department of Health and Human Services. Robust cross-sector collaborations strengthen associations and help to move IECMH practice, programs and initiatives forward. This takes time and commitment from IMHA members. What makes an infant mental health association strong?” In answer to this question, the first two of the seven key areas have been addressed above; identity and cross- systems collaboration. The remaining five areas: competency-informed training; reflective supervision capacity; a sound organizational structure; policy; and higher education, will be addressed in Part Two of this article which will be published online in Perspectives, the near future. Through the lens and use of the Competency Guidelines® and Endorsement®, Alliance IMHA members promote IECMH principles and practices throughout their states and countries. They utilize successful and creative strategies, within and across systems, to build capacity for RSC; to offer competency-informed training; to link with higher education institutions; to advocate for infants, young children, families and the systems that serve them; and to define a clear purpose for both their organizations and their organizational structures. IMHA are invited to use this report to celebrate what has been accomplished and to glimpse at what is possible in the future. Margaret Holmberg, PhD, IMH-E® began her work with infants and toddlers when she was assistant professor at the University of Kansas and ran one of the laboratory preschools. Margaret went on to receive her PhD from the University of North Carolina in Chapel Hill followed by a long and committed service the field of infant mental health. As a member and past president of the Connecticut Association for Infant Mental Health (CT-AIMH), she has had the privilege of representing Connecticut on the Alliance Planning Board and then in 2016 to serve as the first President of the Board of Directors for the Alliance for the Advancement of Infant Mental Health, USA). Ashley McCormick (LMSW, IMH-E®, Endorsement & Communications Director, Infant Mental Health Specialist) is dedicated to promoting workforce development standards for all professionals who work with infants, young children and families through the promotion and use of the workforce development tools, the Competency Guidelines® and Endorsement for Culturally Sensitive, Relationship-Focused Practice Promoting Infant and Early Childhood Mental Health®. Additionally, Ashley provides in-service training and reflective supervision/consultation to professionals in the infant and young child-family field. Ashley’s previous professional experience includes working as an Infant Mental Health Home Visitor in Detroit-Wayne County. Ashley’s training includes a Bachelor’s degree in Psychology and Child Development from Central Michigan University and a Master’s of Social Work from the University of Michigan.